A blast from the past and a skill ride filled with zombie killing. 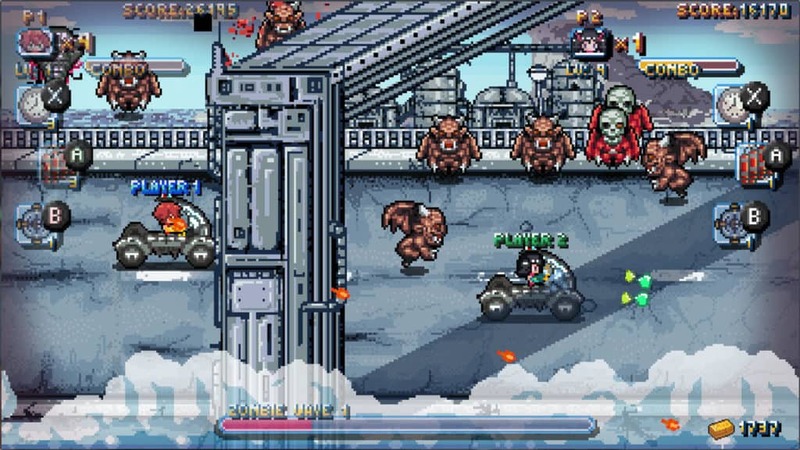 Riddled Corpses EX now hits the Nintendo Switch with a fun take on twin stick arcade shooters. Although sadly the game is only really fun in co-op. Riddled Corpses EX has multiple modes for a player’s enjoyment. There’s a Survival Mode, an Arcade Mode, and Story Mode. The game centers around multiple pixel heroes who arrive during a zombie apocalypse to save the day in the most anime way possible. You can play as up to six different characters, who each have their own abilities, guns, and style. Each additional character can be unlocked by fulfilling the requirements of certain missions or modes. Riddled Corpses EX takes players through various levels of zombie and odd creature slaying action. 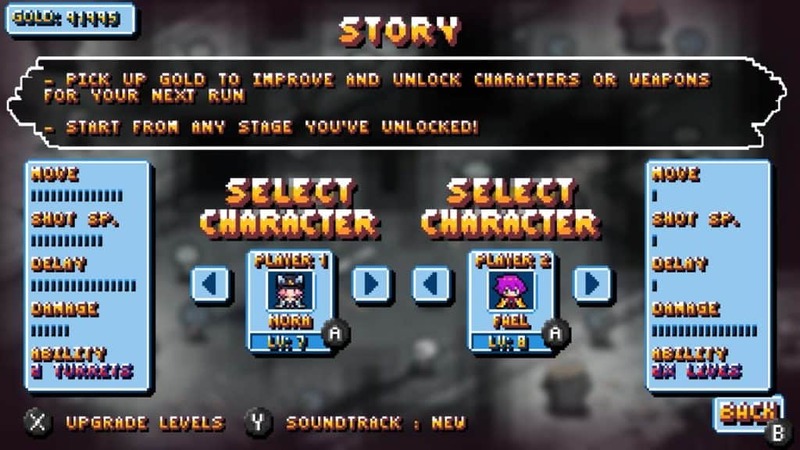 Story mode features a generic and simple campaign where characters do not say much and are pretty straightforward with the survivors they come across. On the bright side, the game gets you right to the action with the story mainly serving as a setting for the gory battles. Story Mode is difficult on a solo run because the characters and starting weapons are weak and no gold is initially available either. Making items unpurchaseable, and forcing players into some heavy grinding in the early stages. I spent a good four hours playing missions before I could make any progress against the first boss. It is definitely a rage inducing game and the vulnerability of characters is just beyond frustrating when enemies swarm out of nowhere. This type of action is not just in Story Mode but in the other modes as well. The only difference between the three is less dialogue and more zombies. Thankfully the game does offer some support to players with interactive objects in the environment. 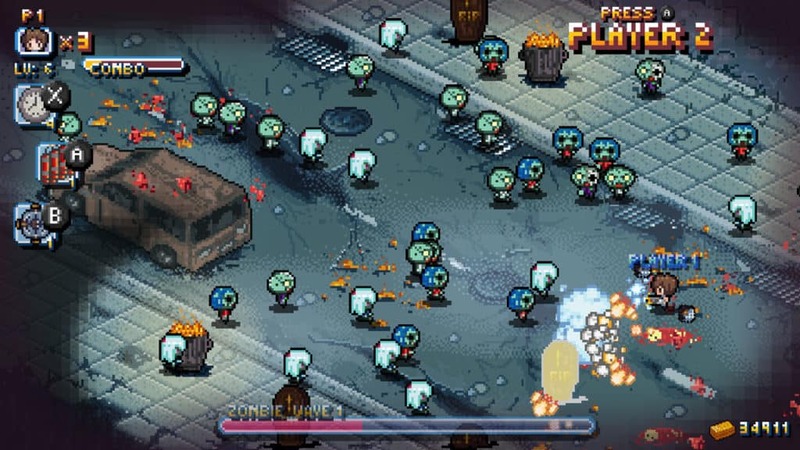 Cars, gas cans, and burning trash cans are shot at to blow up multiple enemies and gain an advantage. If players time it just right, their shots can be deadly explosives that clean house on enemies. Some enemies go down within the explosion while others have their defenses broken and are easy pickings. While it is a twin-stick shooter, the game often turns into a bullet hell game quite often, which isn’t helpful. Especially against bosses where the control scheme becomes unwieldy. It gets frustrating getting used to one way of dealing damage, only for that to change completely once a boss enters the picture. The use of items is necessary as these enemies are bloody tough. As previously mentioned, players start with nothing and are given any money either. Enemies also do not drop items easily, making it a rare occurrence when they actually do. However, enemies do drop gold frequently. The problem is, enemies, swarm around you very fast and leave little room for you to actually pick up the gold before it disappears. On average, I racked up about 20 gold per mission. As you can imagine, four hours of doing the same mission over and over, only to earn 20 gold each time is supremely tiresome. Although the Riddled Corpses EX has been out on other systems for a while, it is best on Switch. Having portable local co-op available is perfect for this kind of game. Making this ideal for you and a friend to have fun slaying zombies together. The game runs at a smooth 60 FPS seamlessly whether on handheld or docked mode. I found the design a bit dull, but it is entertaining for players who want to just want some mindless action. 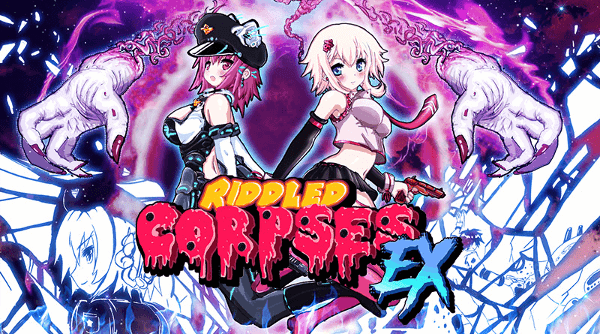 Riddled Corpses EX is a fun game to play in short bursts, ideally with a friend at your side. The level of difficulty makes it a frustrating experience for solo players. On the other hand, the local co-op feature is a plus for social gatherings. Anyone looking to slay some zombies with a friend or perhaps even a neighbor may want to check this out. 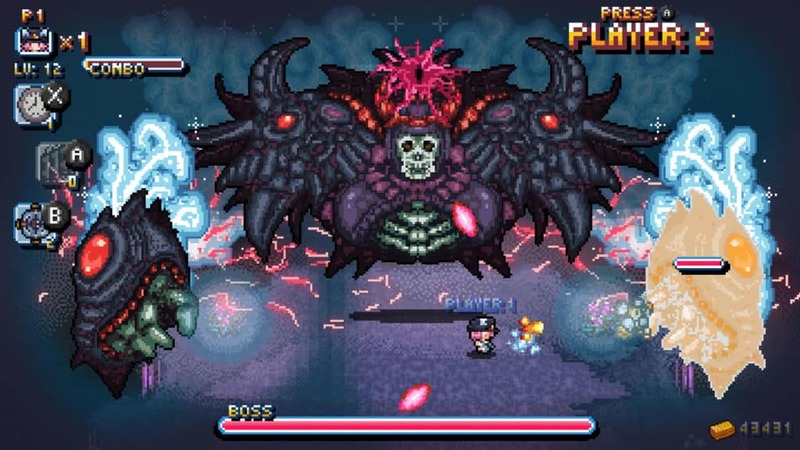 This game was reviewed using a digital code provided by the publisher (Cowcat Games).